U.S. President-elect Donald Trump on Saturday rattled China once again as he left open the possibility of meeting with Taiwan’s president if she visits the United States after he is sworn in on Jan. 20. He also expressed continued scepticism over whether Russia was responsible for computer hacks of Democratic Party officials. In remarks to reporters upon entering a New Year’s Eve celebration at his Mar-a-Lago estate, Trump said, “We’ll see,” when pressed on whether he would meet Tsai Ing-wen, Taiwan’s president if she were to be in the United States at any point after he becomes president. Taiwan’s president will be in transit in Houston on Jan. 7 and again will be in transit in San Francisco on Jan. 13. Trump, citing protocol, said he would not meet with any foreign leaders while President Barack Obama is still in office. Beijing bristled when Trump, shortly after his Nov. 8 victory, accepted a congratulatory telephone call from the Taiwan leader and has warned against steps that would upset the “one-China” policy China and the United States have maintained for decades. Talk of a stop-over in the United States by the Taiwan president has further rattled Washington-Beijing relations. On another foreign policy matter, Trump warned against being quick to pin the blame on Russia for the hacking of U.S. emails. The Washington Post also reported on Friday that Moscow could be behind intrusion into a laptop owned by a Vermont electric utility. 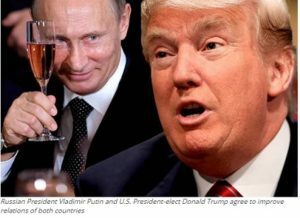 U.S. intelligence officials have said that they are confident Russia was behind the hacks of political figures, which could have played a role in Trump’s victory over Democratic presidential candidate Hillary Clinton. “I think it’s unfair if we don’t know. It could be somebody else. I also know things that other people don’t know so we cannot be sure,” Trump said. But he said that any computer is subject to hacks. Trump tried to end the year on a positive note, however, despite questions about the future of U.S.-Russia relations because of escalating tensions between Obama and Russian President Vladimir Putin, as well as Trump’s promise to crack down on China’s trade practices, which he says unfairly target American workers. “Hopefully we’re going to have great relationships with many countries and that includes Russia and that includes China,” Trump said. As he wrapped up a four-minute informal chat with reporters, Trump also was asked what his 2017 new year’s resolution was. “Make America great again,” he said.